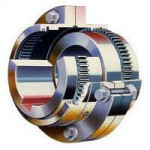 Statewide Bearings can supply all your requirements when it comes to a suitable coupling for your application. Gear couplings are torsionally rigid and are supplied to two designs – Double Engagement and Single Engagement. 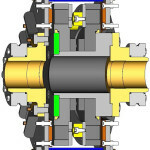 A Double Engagement Coupling comprises two hubs with external teeth gears and two outer sleeves with an internal teeth gear. It’s a coupling for all sorts of applications and accommodates all possible misalignments (angular, offset and combined) as well as axial moments. 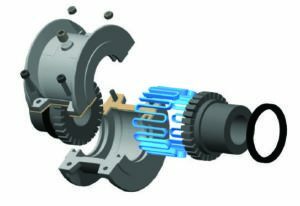 Machines, bearings, seals, and shafts are therefore not subjected to the additional forces, sometimes of considerable magnitude, which arise from unavoidable misalignment usually associated with rigid shaft couplings. Single Engagement coupling comprises one flexible geared half and one rigid half. It does not accommodate parallel displacement of shafts but does accommodate angular misalignment. 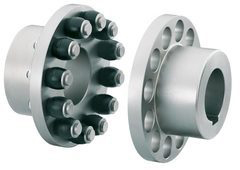 These types of couplings are primarily used for floating shaft applications. Sizes 1010G –1090G all have crowned teeth, this enables the coupling to accommodate static angular misalignment. However, minimising the operational misalignment will maximise the life of the coupling, machine and associated bearing. Economy – Statewide Bearings design of the HRC coupling has been optimised so that power capacities are balanced to the appropriate shaft diameters. Resilience – Transient peak loads are reduced by a flexible element, deflection of which is a prime design consideration. Misalignment – Incidental parallel angular and axial displacement of the connected shafts can be accommodated. 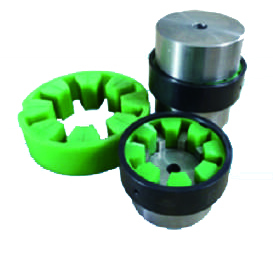 Taper Bushes – Are standard coupling range. Pilot Bored flanges are also available. Installation – Is quick and easy, require only a hexagon wrench for the taper bush. Maintenance – Maintenance is eliminated and no lubricant required. Environment – The elastomeric element makes it suitable for use in most conditions. The Statewide Bearing chain coupling is composed of double-strand roller chain and two sprockets, featuring a simple and compact structure that offers a high flexibility and greater transmission capacity compared to similar sized coupling. The chain coupling allows simple connection and disconnection, and the use of housing cover enhances safety and durability. Easy to assemble and replace.Statewide Bearings Grid Couplings State-of-the-art design Series 2000 is an all-metal coupling that provides positive protection against the damaging effects of shock loads and vibration. Both horizontal cover (H), and vertical cover (V) designs are available. Grid couplings are an excellent choice where torsional flexibility and vibration damping are primary concerns. Part-for-part interchangeable with industry standard grid coupling designs. Most Coupling sizes in-stock in pilot bores. Shot-peened tapered grid flex element for long life.